Swooooooshhhhhhh...that was August flying by - I mean really, August with all its beauty this year seemed not to want to stay very long. This Summer has absolutely flown by - this recipe today was actually suppose to be shared with you in August, as I type this I find myself suddenly thrown into the month of September- does anyone else feel this way? Not to fear, at least in this part of the country, heirloom tomatoes are still gracing the tables of farmers markets and stands - in all of their glorious juicy goodness. You know you picked the bets of the best when you bite into a freshly salted heirloom tomato and you are covered in tomato juice with a bit running down your chin. So messy, but so good. 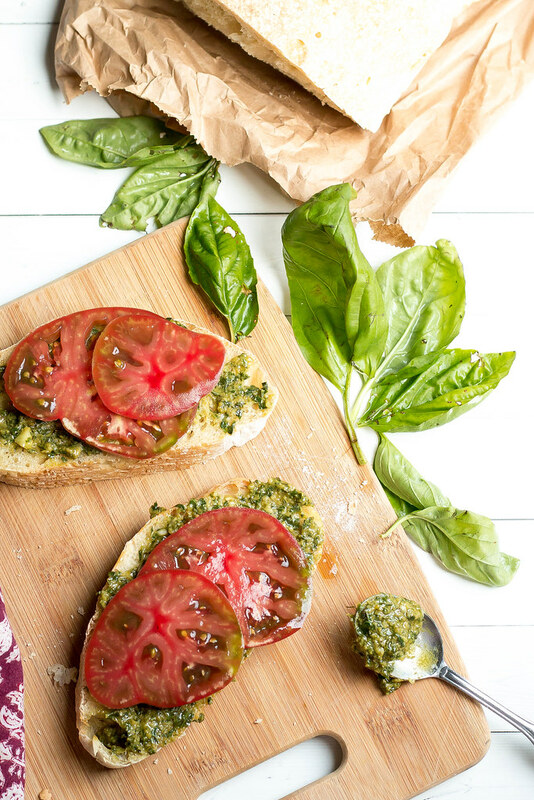 One of my favorite parts of summer is the copious amounts of basil - so fragrant and never disappointing. 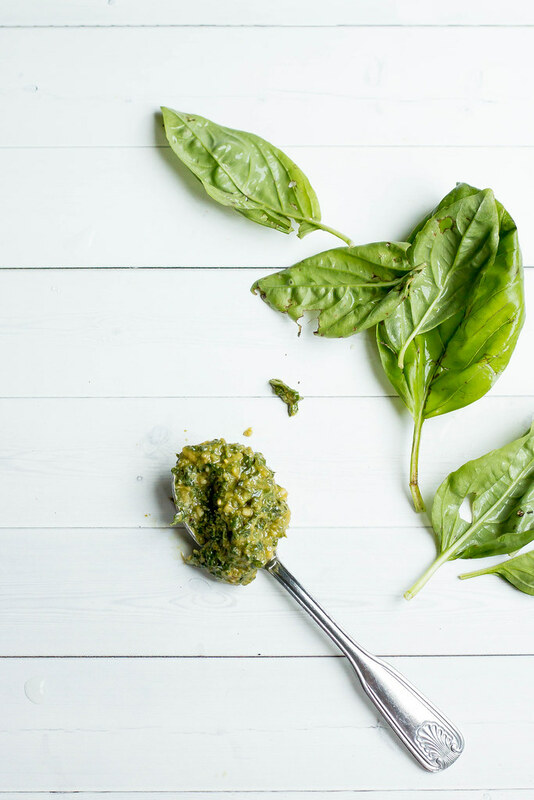 Along with making jam as a Summer must, making a big batch of pesto is one too. 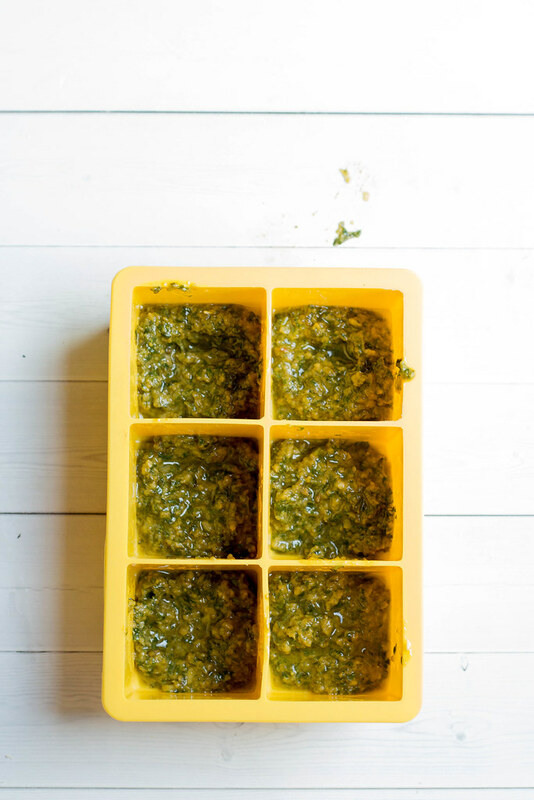 Pesto freezes beautifully. I love adding a cube to winter stews. roasted potatoes + pasta - a little bit of Summer to brighten the dreary winter days. 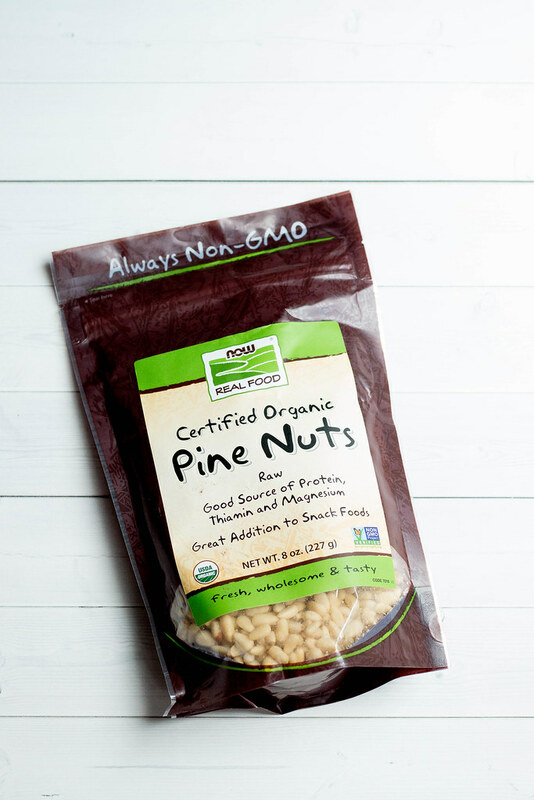 Pine Nuts are really quite special in pesto - NOW carries an organic version which is pretty awesome as organic pine nuts have been proven hard to find at my local grocers. 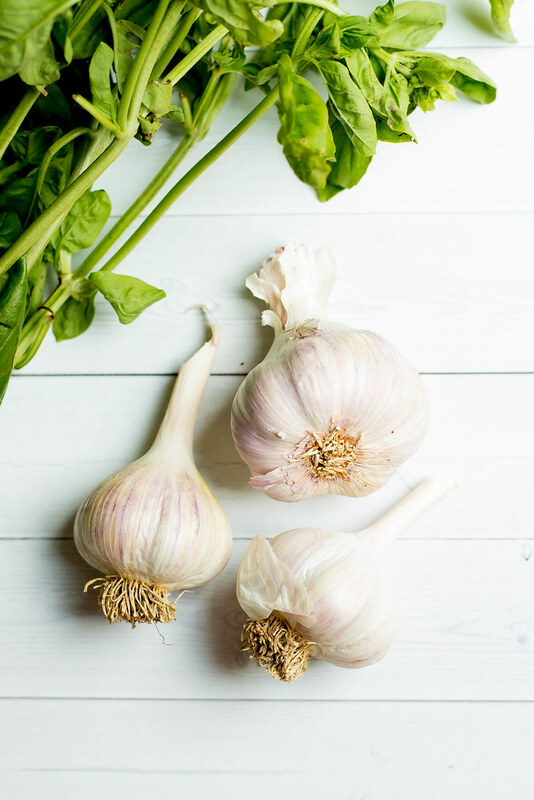 My local farmer at Picnic Rock Farms grows the absolutely best garlic I have ever come across - it is sweet and mellow // I downright hoard this garlic for the winter. 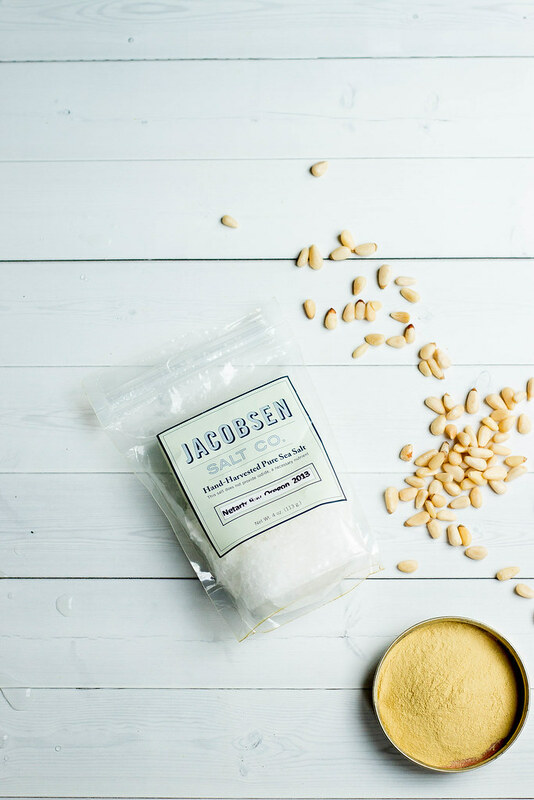 Another thing I hoard- Jacobsen Sea Salt // a luxury that I use sparingly. Hand picked + sorted sea salt, totally splurge worthy. 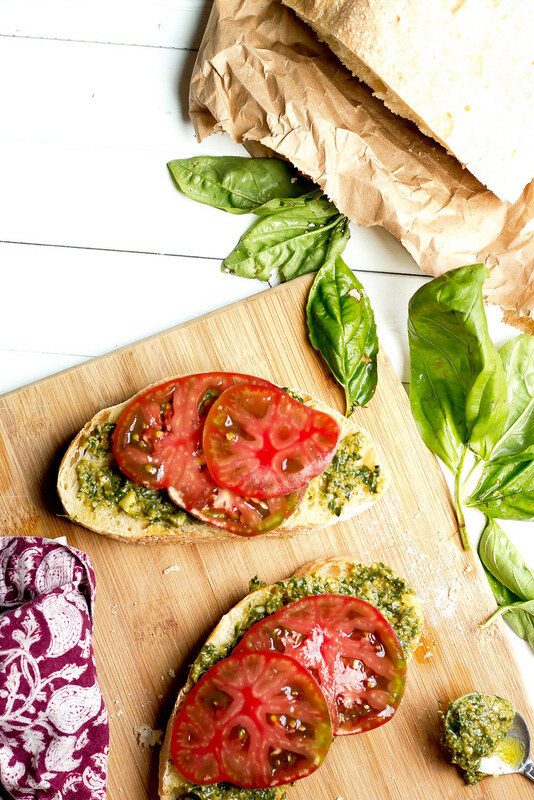 Nooch replaces the traditional parm in the pesto - add as little or as much as you'd like! Another love of mine - ciabatta bread! If i'm not careful I can eat an entire loaf in a day. Grilled, buttered, as a sammie- any which way , I'm totally smitten. I want you to make this at home with the help of NOW! For a chance to win simply leave a comment below or visit NOW on Facebook ! 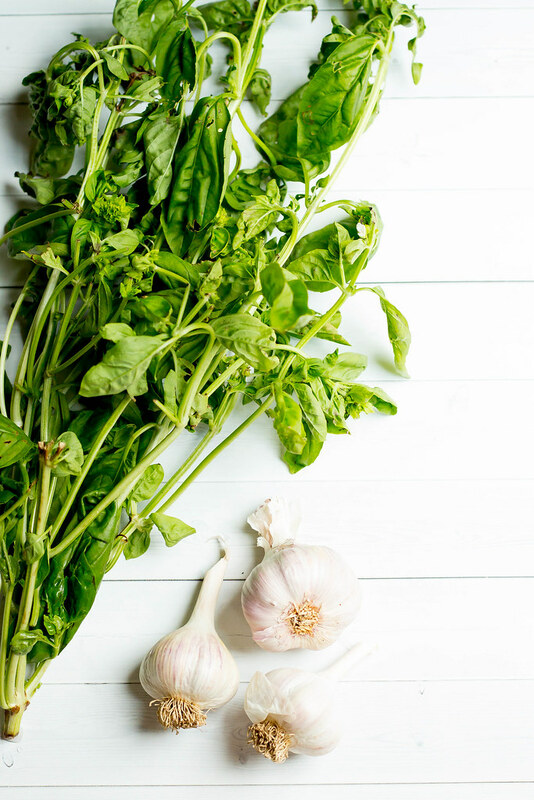 In a food processor place basil leaves, pine nuts, garlic + nooch and process fro about 30 seconds or until nuts begin to breakdown. With the processor running drizzle in olive oil until well blended or to your likeness. Add salt to taste and pulse a few times to incorporate. 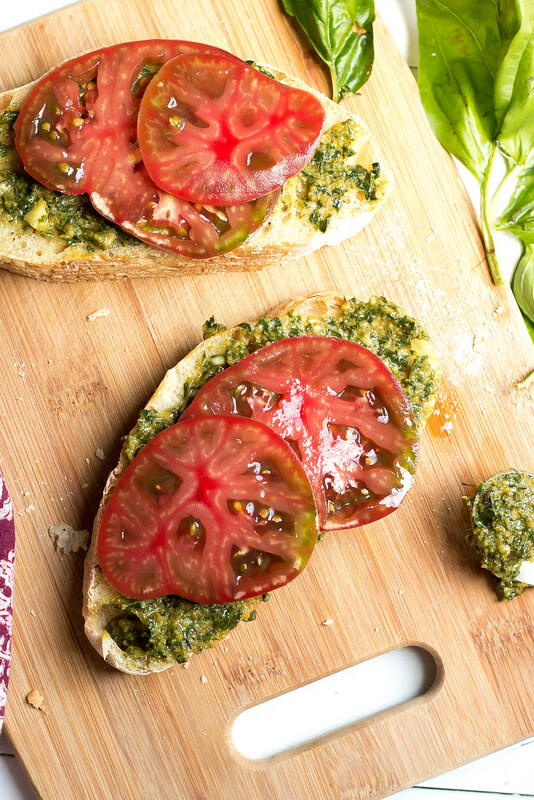 To assemble the tartines- spread one side of 2 slices of good bread with pest, layer with slices of heirloom tomatoes and sprinkle with good flaky sea salt. I also cannot WAIT to try this recipe, it looks so delicious!! It only took me over 30 years, but I'm really starting to really like tomatoes, this recipe sounds perfect!! This looks so beautiful and the perfect encapsulation of everything good this season. I just love ripe summer tomatoes. My favorite part of this summer was my trip to the Pacific Northwest. I was in hospital twice and had major surgery. I should be recovered for fall. So was in during the Phoenix heat and as weather cools I am getting better!!! Best time of year to be laid up!!!!!!! I just found your blog and I'm LOVING it!!!! Thank you so much for this. One question, what is nooch? I took a short vacation with my Dad and my partner - the highlight of the summer. :) Thanks for the giveaway! Glad that this recipe is vegan. Will try it soon since it looks so delicious. Favorite part of the summer was going on a trip to the southwest to visit various national parks. Magnificent. I take a lot more garlic for the pesto. I also add a little white vinegar (balsamico), which makes it taste a little better, and ground black pepper. I never tried it with yeast. 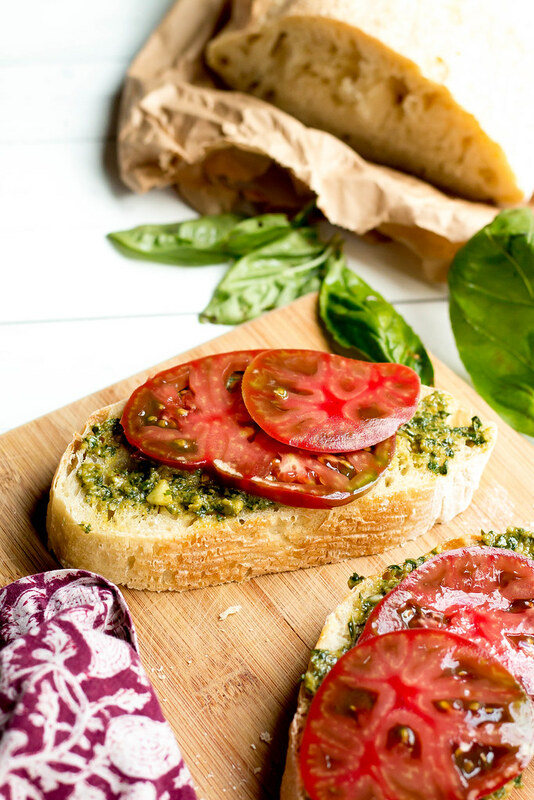 And the pesto-covered bread can also be toasted quickly upside down in a non sticking frying pan, or in a oven heated from above, if it's a gas oven on the highest level. And then covered with cold tomatoes it surely tastes great. Your photography is just absolutely gorgeous and these look delicious! Webroot holds a strong market reputation among the top cybersecurity companies. The private American company delivers hi-end security solutions to ensure the computer and mobile users that their devices are safe and secured against hacking attacks, viruses, malware, spyware, and other threats. Moreover, the cybersecurity firm also renders 24*7 webroot antivirus support services to provide its customers with a platform to get an answer to their queries.